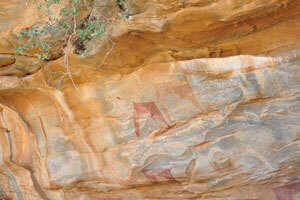 This is one of the most important rock art sites in eastern Africa for two reasons - the high number and quality of the panels of rock art, and the originality of the representations of cattle and characters. 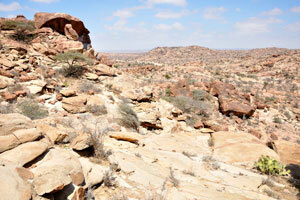 The caves lie about 55 kilometers northeast of the Somaliland capital, Hargeisa. 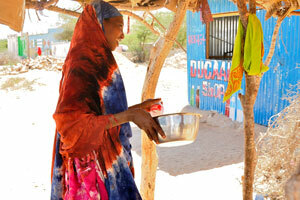 On the way from Hargeisa to Laas Geel we stopped to buy some camel milk. 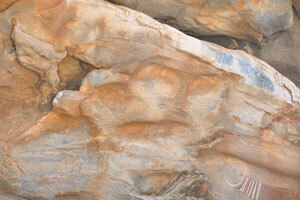 I have never drunk camel milk before. 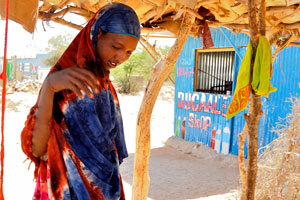 The saleswoman of camel milk is beautiful. 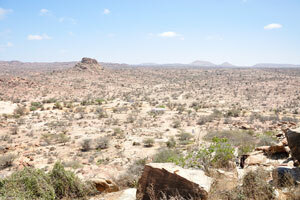 This is the place where we stopped to buy the camel milk. 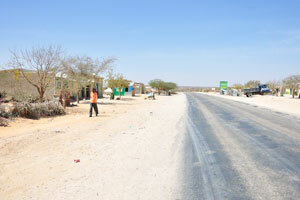 The road between the Hargeisa city and Laas Geel is covered by the asphalt. 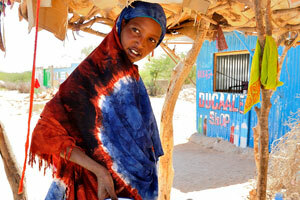 Smiling lovely girl is standing near the colourful nomad hut. 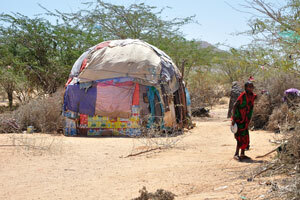 This nomad hut is an architectural masterpiece. 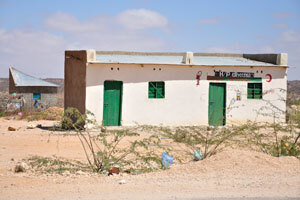 White building with the green doors. 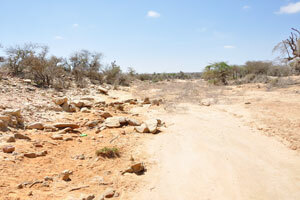 There is a short stretch of road without asphalt just before Laas Geel. 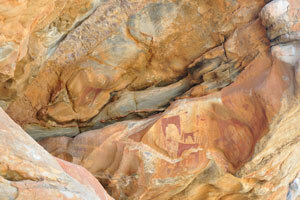 We have arrived to Laas Geel. 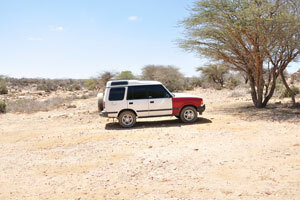 We have left the car at this place. 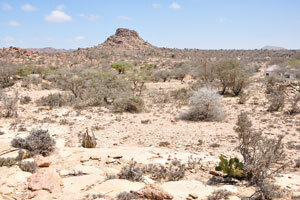 The mountain of Laas Geel and the wall of the visitor's center building. 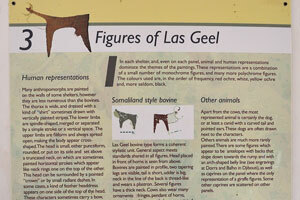 Figures of Laas Geel: human representations, Somaliland style bovine and Ethiopian style bovine. 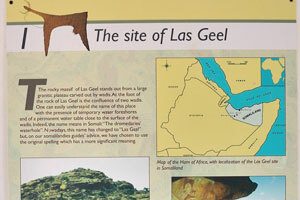 The site of Laas Geel. 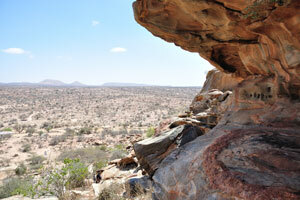 Archaeological test pits in shelter 7 and rock art in Somaliland. 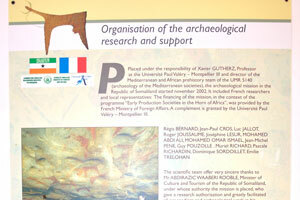 Organisation of the archaeological research and support. 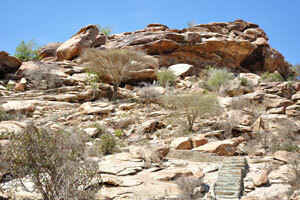 The stairway leads to the complex of caves and rock shelters. 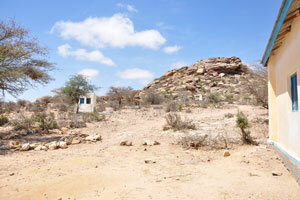 Translating to "The Camels' Well" in Somali, Laas Geel is located halfway between the cities of Hargeisa and Berbera in Somaliland, a self-declared republic and autonomous region of Somalia. 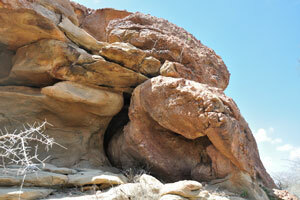 The Laas Geel shelters are made of naturally occurring rock formations. 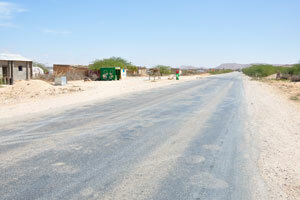 Although Laas Geel consists of about twenty shelters of varying size, the largest are about ten meters long with a depth of about five meters. 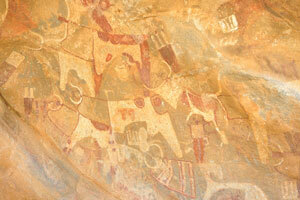 These shelters feature polychrome painted panels that are considered to be the oldest known rock art in the Horn of Africa. 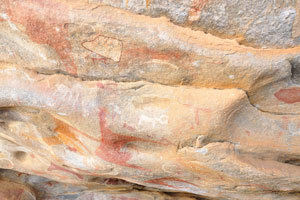 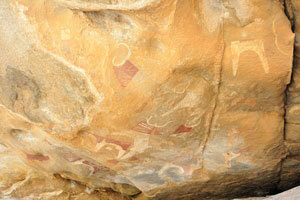 Paintings have also been noted in smaller shelters around the Laas Geel area. 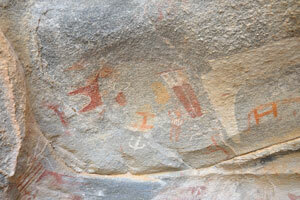 The site is excellently preserved due to the location of the paintings which are covered by the granite overhangs. 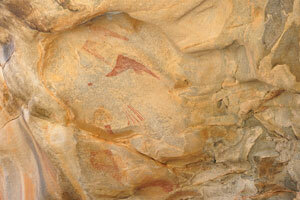 French archaeological team discovered the isolated Laas Geel caves in 2002. 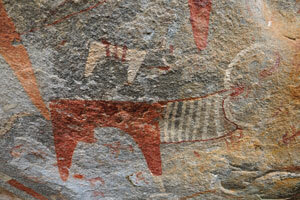 Depiction of a ceremonial cow. 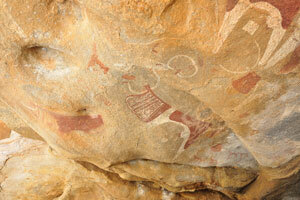 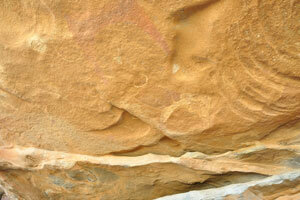 Laas Geel cave paintings in Somaliland have an outstanding quality, archaeologists say. 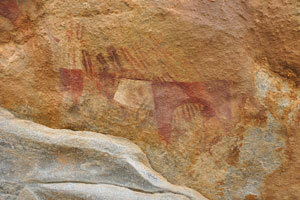 The necks of the cows are embellished with a kind of plastron. 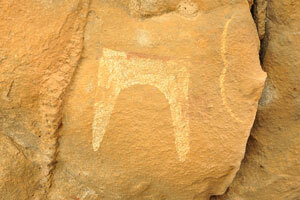 The Laas Geel caves can reached by the road to the port city of Berbera. 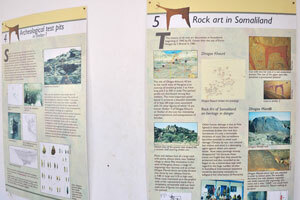 The caves are located in 3 miles off the main road between Hargeisa and Berbera. 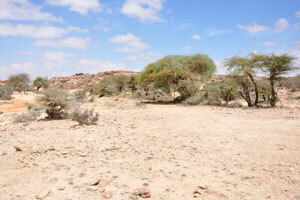 In the Somali language, Laas Geel means “where the camels once watered”. 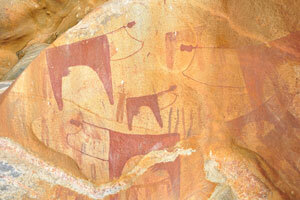 I am on a background of the depiction of a ceremonial cow. 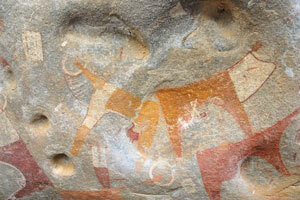 Few of the paintings show giraffes, dogs, antelopes, camels and other animals. 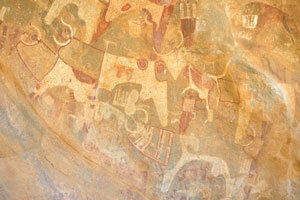 Some of the paintings show the indigenous nomadic people worshipping cows. 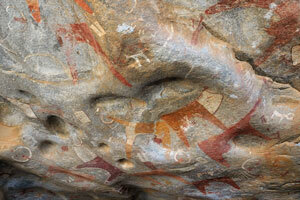 This cave art is among the oldest found in Africa. 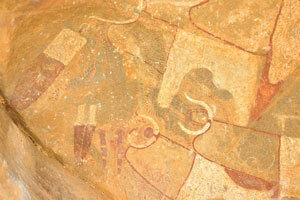 This incredible archaeological find deserves to be designated as a UNESCO World Heritage site. 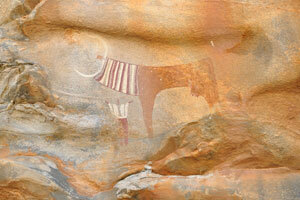 Depiction of a skinny horned cow. 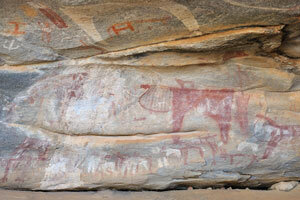 A human and a cow. 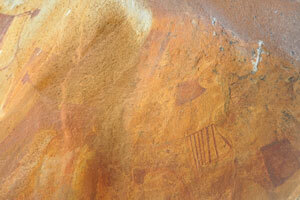 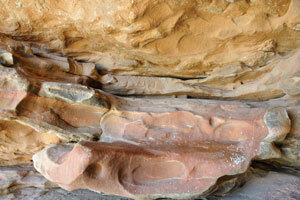 This precious repository of ancient rock art lacks the good highway road signs. 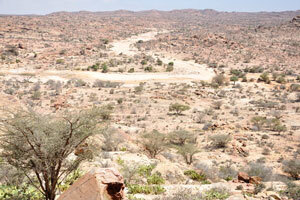 Laas Geel could become a major tourist attraction and economic boost to Somaliland. 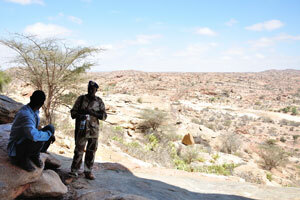 Guards of the Laas Geel complex. 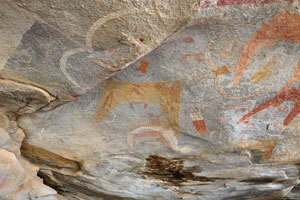 The Laas Geel caves are located about 37 miles northeast of Somaliland's capital, Hargeisa. 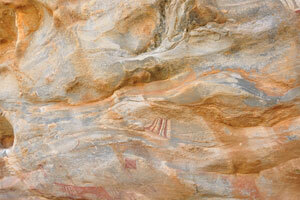 Such a view will open before your eyes from the mountain of Laas Geel. 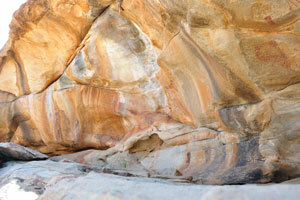 One of the alcoves at Laas Geel. 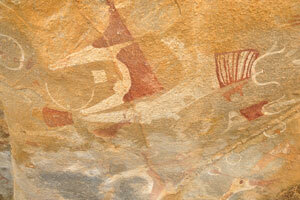 A part of an ancient world. 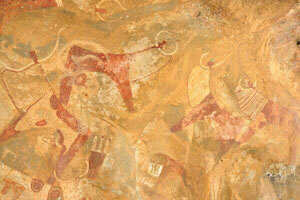 The Neolithic Laas Geel cave paintings are similar to the Paleolithic Lascaux cave paintings near Montignac, France. 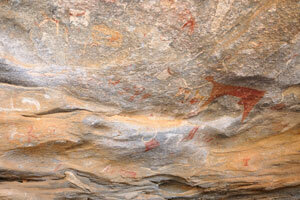 This cave art also resembles the Spain cave paintings. 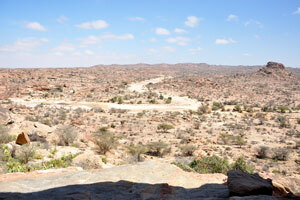 You may sit and rest here for a while, contemplating the landscapes of Somaliland. 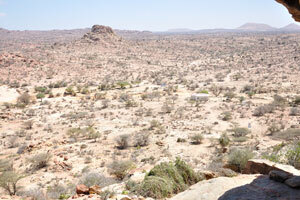 Sweeping view of the surrounding countryside from the Laas Geel mountain. 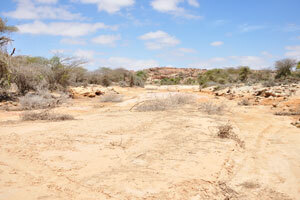 The dry and stony plain landscape that makes up much of Somaliland nowadays. 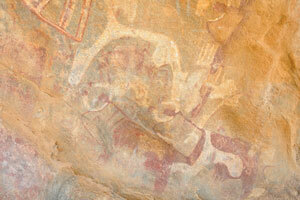 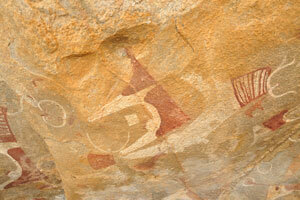 One of the things that inspired me to go to Somaliland was the recently discovered painted caves of Laas Geel. 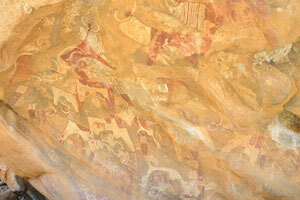 The entire interior of the shelter is covered with figures. 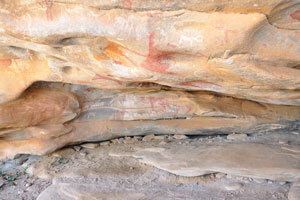 The painted caves of Laas Geel are actually rock shelters. 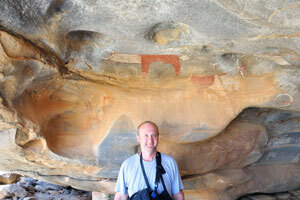 The local guide leads us scrambling over the hillside to find more shelters. 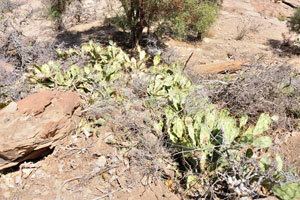 Opuntia shrub grows on the slope. 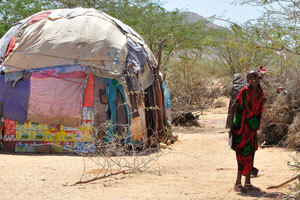 Nomads we passed a mile back would draw the same images if they could pluck up the courage to enter the shelter. 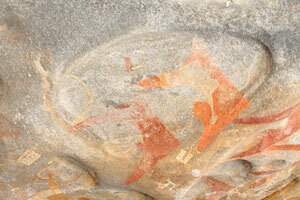 Hundreds of magnificent rock art paintings adorn the walls of several interconnected caves and shelters. 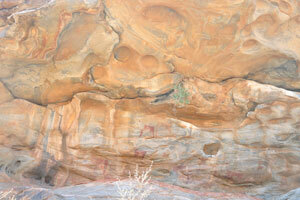 Top part of an ordinary rock shelter. 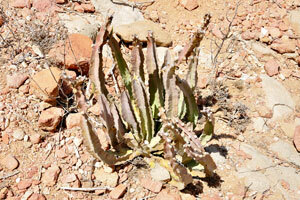 Succulent plant with four ribs. 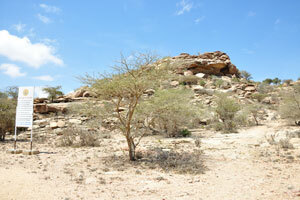 The steep slope of Laas Geel. 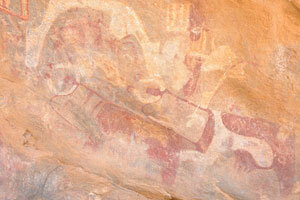 Some paintings exceed one metre in length and their state of preservation is exceptional. 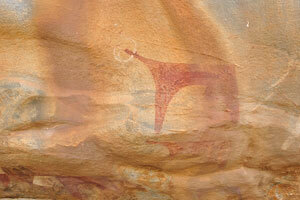 Depiction of a cow with an extraordinarily decorated neck. 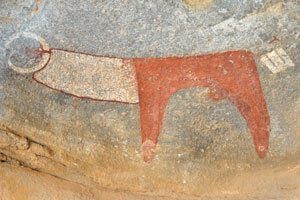 The majority of the paintings at Laas Geel depict cattle. 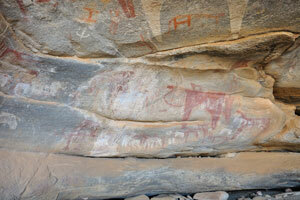 Is it the bull mating with the cow? 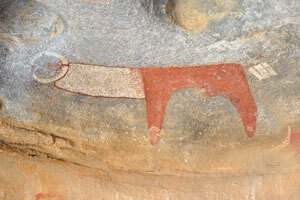 Depiction of a representative of small livestock. 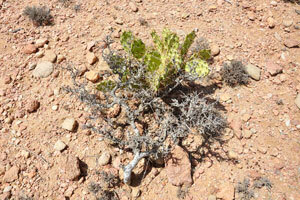 Even the cactus looks almost dry, but there is nothing unusual in these deserted conditions. 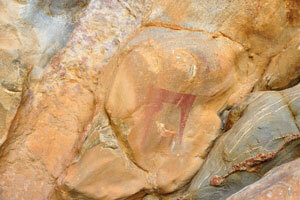 Was this painting a neolithic equivalent of nowadays graffiti? 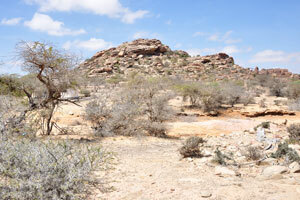 Somaliland in general is home to numerous such archaeological sites. 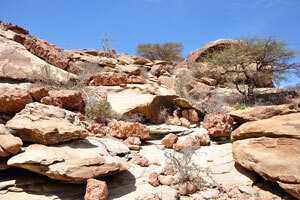 Laas Geel is a complex of caves and rock shelters in the Somaliland. 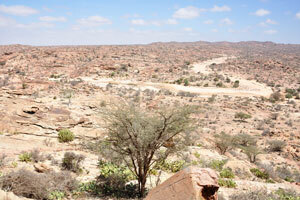 Laas Geel is the most popular tourist attraction in Somaliland. 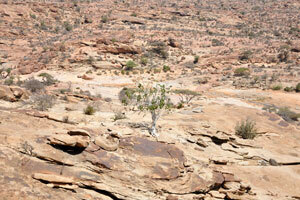 The stark beauty of the desert landscape.